Compatible kegs: 6L Perfectdraft, 5L Standard, IPS and Beertender, 4L Beertender. This universal beer dispenser, Multi Beer Evolution, is compatible with nearly 200 different mini kegs! 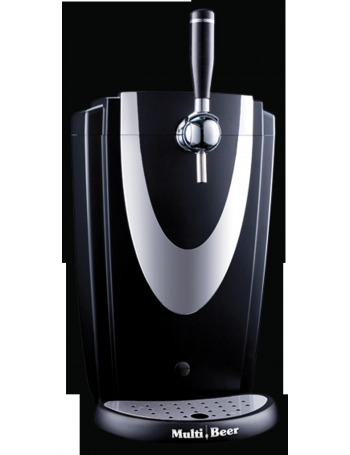 Get yourself the top quality of a high dispensing technology to tap all the beers you want!Designed to abolish the restrictions of beer kegs, Multi Beer welcomes all your kegs: 5L standard, pressurized, 5L Beertender or even 6L Perfectdraft. New Version: Multi Beer Evolution! More compact and with a more sober style, this new machine is equipped with a Peltier cooling thermo-electric system. Like any other dispenser (Perfect Draft or Beertender) it allows you to tap all the beers you want, just like in a bar! Multi-Beer Evolution accepts all kind of mini-kegs: Standard, Spi, Beertender or even PerfectDraft. Therefore, it will be easier to choose your keg and you won't have to worry whether it is compatible or not. Choose among your favorite breweries a compatible keg for your dispenser: Heineken? Pelforth? Afflighem ? Desperados ? Leffe ? Stella Artois ? Jupiler ? Jenlain ? Météor ? Ch'ti... ? It is a functional machine that allows you to set a desired temperature thanks to an adjustable cooling system visible on the front screen. You may choose between a cold temperature for a fresh lager or slightly more temperate for a fine dark beer. Multi-Beer is perfectly designed for it. It is also a multipurpose machine; it serves beer along with other beverages such as water, wine or even fruit juice if you have a multi-drink tank. A practical machine indeed, a user-friendly dispenser. It can be put away very easily since it is 50cm high, 48,5cm deep and 28,5cm long. The dispenser comes with a Peltier thermo-electric system that allows it to reach a minimum temperature range of 3 to 5° for a room temperature of 22 to 25°C. 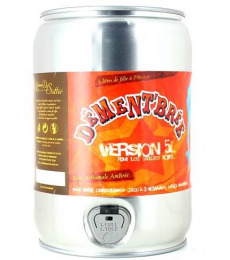 It is delivered with instructions and three adapters, allowing you to use all kind of kegs. - CO2 Kit : for 5L Standard Keg users. These kegs are originally unpressurized so their shelf life once opened is relatively short (24H). This CO2 Kit provides your 5L Standard Keg a shelf life similar to pressurized kegs: i.e 31 days. This kit can also be useful when you reach the end of the 6L Kegs.